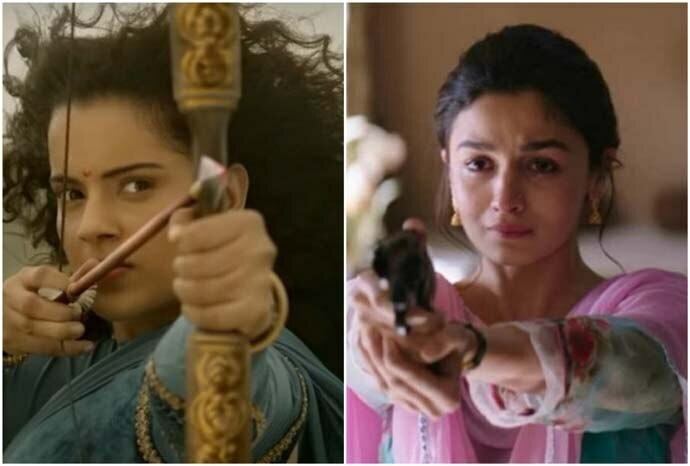 Kangana Ranaut Vs Alia Bhatt: The nepotism war is raging on, with the Queen of Manikarnika taking on the ultimate industry insider! Kangana claims she's supported other stars' films but no one showed up for her. Alia's response has been composed but hardly Raazi. If Kangana Ranaut represents an outsider in the ‘big, bad industry’ called Bollywood, Alia Bhatt is an 'insider', a talented insider, no doubt. What happens when the duo fight? While Manikarnika was the first movie where Kangana Ranaut was seen battling it out on screen, in real life, there have been a lot of battles the actress has been fighting. (Coincidentally, all these battles either precede or follow her movie releases). Manikarnika released on January 25. The same day on which Thackeray released. There were mixed responses to both the films, though the unanimous judgement was that Thackeray was a better-made movie. Then came the Kangana-Krish spat in full public glare once again. Now, in a recent interview, Kangana has trained her guns against every other Bollywood star — apparently for not supporting her film. “Is Jhansi queen my aunt? Her contribution to the freedom struggle has made the country free. It’s not only Kangana Ranaut who is free,” she said, expressing her displeasure on how there was no word-of-mouth publicity for her film. She named Alia Bhatt and Meghna Gulzar, saying how she had watched the trailer of their movie Raazi and called them up, praising the film. Nothing of that sort happened for Manikarnika. “Now I will expose them all,” said Kangana. Deepika, Anushka, Sonakshi are also on the radar. Here’s a fact check though. Yes, it is true that no actor, apart from veterans like Asha Parekh and Waheeda Rahman, have actually praised the movie. Among the younger crop, only Shraddha Kapoor praised the movie, according to a few reports. On the other hand, Uri and Ek Ladki... received massive, even gushing praise. So, what’s the Standard Operating Procedure in Bollywood? A movie is like a child of every stakeholder. They put all their clout ( in a good sense, we mean) into place. The who’s who of related industries are invited to a special screening, so that their word on social media starts influencing the audience. (Not going into media reviews and all). And, there are various kinds of understanding, of course. Karan Johar retweets a lot of movie trailers, praising them. Anurag Kashyap tweeted after seeing Thackeray, making it clear that he is so, so proud of Nawazuddin Siddiqui. So, it’s a mutual thing — you support me. I’ll support you. When Aamir Khan's Thugs of Hindostan was being shredded into pieces, Shah Rukh Khan said the movie didn’t deserve such discredit. In this game of scratching each other's backs, where does Kangana Ranaut feature? Karan Johar will of course not promote Kangana’s film — why would he? For the first time ever, she brought charges of nurturing a closed and privileged group against him, right in the public sphere. Kangana also apparently never shared good vibes with the Khans. In 2014, Deepika Padukone dedicated one award for best actor to Kangana Ranaut. It was the same year in which Revolver Rani and Queen released. So, apparently, they were friends then. But similar issues cropped up as Kangana attended the premier functions of DP’s movies — while DP allegedly refused. Basically, Kangana has no friend in the industry. Priyanka Chopra was a friend once, apparently. But we are sure Priyanka Chopra was busy, and hence missed Manikarnika. So, where does it all lead to? Kangana vs Bollywood — where Kangana is firing salvos at it and the rest of the industry is not even reacting. Alia Bhatta has expressed her apology in a very composed manner, saying she would call her. But will she watch Manikarnika? Meanwhile, here's the truly important part. The movie earned Rs 84.55 crore in 12 days.